Izmir, Turkey is a part of the Logistics Plus® network. This office provides air and ocean freight forwarding, inland ground and rail, warehousing and distribution, project cargo, import/export, and global trade compliance services. Izmir is a large metropolis in the western extremity of Anatolia and the third most populous city in Turkey, after Istanbul and Ankara. 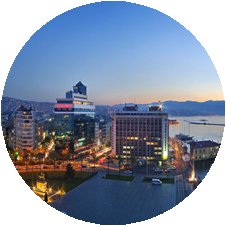 İzmir’s metropolitan area extends along the outlying waters of the Gulf of İzmir and inland to the north across Gediz River’s delta, to the east along an alluvial plain created by several small streams and to a slightly more rugged terrain in the south. The ancient city was known as Smyrna, and the city was generally referred to as Smyrna in English, until the Turkish Postal Service Law of 28 March 1930 made “İzmir” the internationally recognized name. Turkey’s largely free-market economy is increasingly driven by its industry and service sectors. The automotive, construction, and electronics industries are rising in importance and have surpassed textiles within Turkey’s export mix. Izmir is also home to a Logistics Plus office where we proudly serve both small and large businesses throughout the region. If you’re located in Izmir, or any other surrounding community, your friends at Logistics Plus are ready to provide you with local, domestic, and global transportation and logistics services. Additionally, we’ll show you how our people in Turkey put the “plus” in Logistics Plus by doing the big things properly, and the countless little things, that together ensure complete customer satisfaction and success!